The collection has not just an unusual grouping of authors, but an unusual near-balance between men’s stories and women’s. Both reviewers highlighted Basma el-Nsour’s “The Brass Kohl Pot” as a particular favorite, and Arab Hyphen laid emphasis on several of the women’s stories: Magdalene Abu el-Rub’s “The Backyard” about a woman’s escape from her abusive family, Manal Hamdi’s “Stained by Roses” about a lonely seamstress-prostitute, and Julnar Zain’s “Big Fang,” a strange blend of fairy tale and realism. 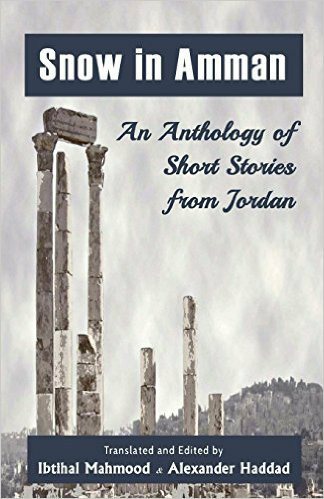 If you like multi-author short-story collections, almost certainly you’ll want to read Beirut Noir, a collection of Lebanese short stories coming at the end of the year from Akashic, ed. Iman Humaydan. Reblogged this on Ammani Notebook.